How To Care For Your Custom Orthotics | Dynamic Physiotherapy & Sports Injury Clinic Inc. 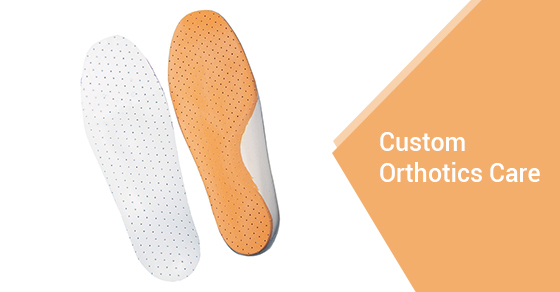 Custom orthotics are custom made insoles that have been specifically designed for your feet, to provide additional comfort and support for those with feet pain, from heel pain to plantar fasciitis to poor lower limb alignment, as just a few examples. They are designed by medical professionals and therefore are much more effective than traditional insoles that you can purchase from the drug store. Once you’ve taken the time to have your custom made foot orthotics made, it only makes sense that you would want to keep them in the best possible condition. This article will take you through how to care for your custom made foot orthotics so that they last as long as possible. The good news is that there really isn’t that much you need to do! Above all, you should avoid getting your foot orthotics wet. Insoles with foam cushions or that are covered in cloth can get water damaged, so aim to keep them dry. If you do get them wet, pat them with a towel and then place them in an area with a lot of ventilation, allowing them to lay flat. Ensure that you give them time to dry completely before using them. To keep your orthotics in good condition for as long as possible, it is important to wash them whenever you notice they are particularly dirty. Cleaning them regularly will ensure that odours are minimized and that they don’t develop stains. How you wash them is what’s most important here. Take care to hand wash them under running water with a damp cloth and a bit of mild soap. The key is to ensure that you don’t submerge them under water, especially hot water. Hot water can potentially hinder their effectiveness. As a general guideline, never place your orthotics in water that is hotter than you can personally stand. You should then allow them to air dry. Always avoid the washing and drying machine. Note: if you are concerned about any odours, you can take your orthotics out of your shoes and allow air to circulate around them. While custom made foot orthotics are designed with quality materials that are meant to last, it is still important to periodically check for signs of general wear and tear and replace them as necessary. The average lifespan can vary a lot depending on their use, so ensure that you replace them as necessary to remain pain-free. Dynamic Physiotherapy is a leading physiotherapy and sports injury clinic in Ontario with quality, custom made foot orthotics. Contact us today for more information.